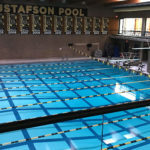 Three Gustavus divers competed at the NCAA Region 1 Diving Championships on Friday and Saturday. Logan Bican (Jr., Monticello, Minn.) and Jonathan Bovee (Sr., Farmington, Minn.) represented the men's team, while Sophia Steinberg (So., Faribault, Minn.) represented the women. 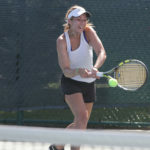 Gustavus women’s tennis player Ginger Valentine (So., Delano, Minn.) competed in the first round of the ITA Cup Thursday morning and lost to No. 4 seed Venia Yeung of Wesleyan 6-0, 6-2. Valentine, now 9-1 in singles play this season, drops into the consolation bracket and will face the loser of Ysabel Gonzalez-Rico of Emory and Risa Fukushige of Skidmore on Friday morning. For the second consecutive season, the Gustavus women’s tennis team has produced the singles champion at the ITA Midwest Regional Championships. On Monday morning, Ginger Valentine (So., Delano, Minn.) defeated Ali Kopiecki of Hamline 6-0, 6-4 to earn All-America status. Valentine joins teammate Bri Hartmann as ITA Midwest Region singles champions as Hartmann achieved the feat last year. Valentine is the 42nd All-American in program history. Day three of the 2018 ITA Women’s Midwest Regional Championships concluded Sunday night with the doubles championship and the singles semifinals. Day two of the ITA Midwest Regional Championships wrapped up Saturday with Gustavus advancing two singles players and one doubles team to the quarterfinal and semifinal rounds, respectively. Ginger Valentine and Bri Hartmann will play in the singles quarterfinals at 9 a.m. Sunday. Valentine will face Natalie Wijesinghe of UW-Eau Claire and Hartmann will take on Grace Riermann of Bethel. The doubles team of Hartman and Lilly Hartman will take on Maggie Riermann and Grace Riermann of Bethel in the semifinals. 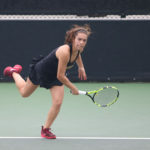 Gustavus women’s tennis ace Briana Hartmann (Jr., Owatonna, Minn.) Thursday experienced her first NCAA singles tournament, winning the first match and losing in the second round against the defending national champion. Hartmann, who earned All-America status in the fall by winning the ITA Midwest Regional and taking fifth at the Oracle Cup, finishes her season with a 26-10 singles record. The Minnesota Intercollegiate Athletic Conference announced its women’s tennis postseason awards Tuesday and five Gusties were recognized as All-Conference members, while Head Coach Jon Carlson has been selected as the Co-Coach of the Year. The NCAA Division III Swimming & Diving Championships concluded Saturday as Maggie Webster (Jr., Apple Valley, Minn.) and Kate Reilly (Sr., Hastings, Minn.) swam the 100 freestyle, and Tanner Sonnek (Jr., North Mankato, Minn.) competed in the 200 breaststroke. Webster and Reilly finished the 100 free in 20th and 30th place, respectively, with personal best times of 51.41 and 51.85. 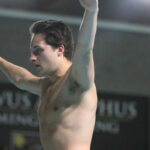 Sonnek was disqualified in the 200 breaststroke after the official deemed a turn violation.